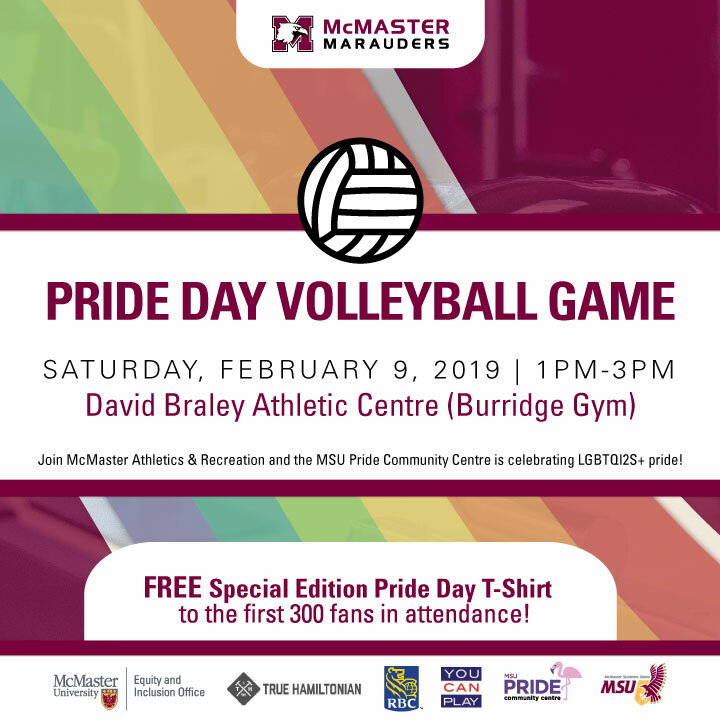 Having made diversity and inclusivity Department priorities several years ago, McMaster Athletics & Recreation is pleased to partner with the McMaster Equity and Inclusion Office, the MSU Pride Community Centre, and RBC to make Saturday, February 9th McMaster Pride Day in support of the LGBTQ+ community, and in conjunction with the volleyball doubleheader that McMaster will be hosting, with the Marauders taking on the Nipissing University Lakers. One of McMaster Athletics’ longest-serving corporate partners, RBC has taken on a leading role for this event and will host a panel discussion at the RBC branch located in the David Braley Athletic Centre at 11 a.m. which anyone may attend, although space is limited. The panel discussion, “How communities can create increasingly inclusive environments for youth in Pride community,” will be moderated by Dr. Arig al-Shaibah and will consist of Mary Craig (Marauder Women’s soccer player) Miranda Clayton (MSU Pride Community Centre Coordinator and one other participant. The panel will include LGBTQ+ community leaders, including McMaster student-athletes, to address and discuss issues around building inclusive environments and reducing barriers for those within the Pride movement, both on-campus and in the workforce. Focus will then shift to the Burridge Gym for the volleyball doubleheader which starts at 1 p.m. with the women’s match, followed by the men taking the court at the Burridge Gym at 3 p.m.
A special bonus for the first 300 fans in attendance will be a free event t-shirt. To purchase Marauder Volleyball tickets online, visit maraudertickets.com.